If you right click on the Taskbar and go to Properties, this is the screen you will get. If XPs interface is confusing switch to the Classic View, which will look like 98. If you go to My Computer and right click on the Harddrive and go to Properties you will get this screen. One really nice feature with this, is that it will give you the Brand names of most of the Hardware. Under the Tools Tab will be, Scandisk ( Error Checking ) and Defragmentor. Under the General Tab will be Info on the Drives and the Disk Cleanup Utility. 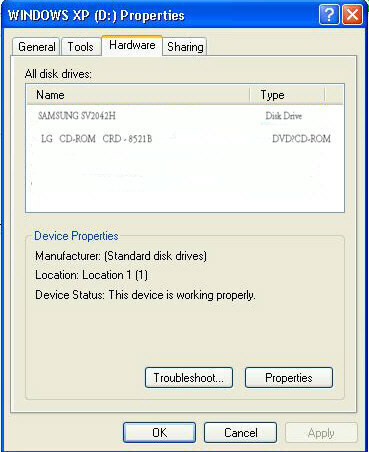 This is where you go to use Scandisk or Error-checking in XP and Defragmentor or Defragmentation in XP, you can go to Start/My Computer and right click on the drive you want or Local Disk C: and go to Properties. To use Scandisk click the Check Now button, check the Automatically fix file system errors, it will run when you Reboot XP. To Defrag XP click on the Defragment Now button, then click the Analyze button and XP will see if it needs to be Defraged. 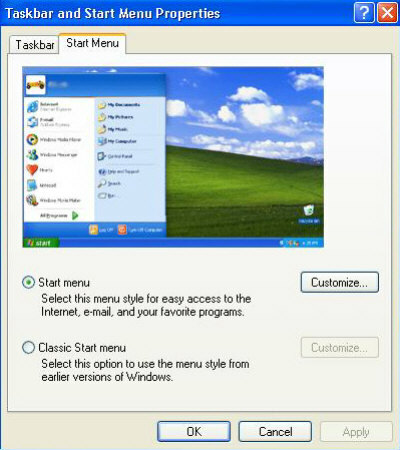 The Backup button would be used if you have the Restore Feature Activated and want to create a backup/Restore point before you do something in XP or are going to install some new software you are not to sure about. I do not use the Restore feature, Why ? because I only use the Computer for gaming and recieve no email on it.